Of all the different ways for one to get their fix of news, RSS has persisted. RSS, for the uninitiated, stands for Rich Site Summary. It is a way to deliver content that is constantly changing, which is why it is perfect for news sites and blogs. It packages all their content into easily digestible feeds, that can be easily organized and read through any number of apps. 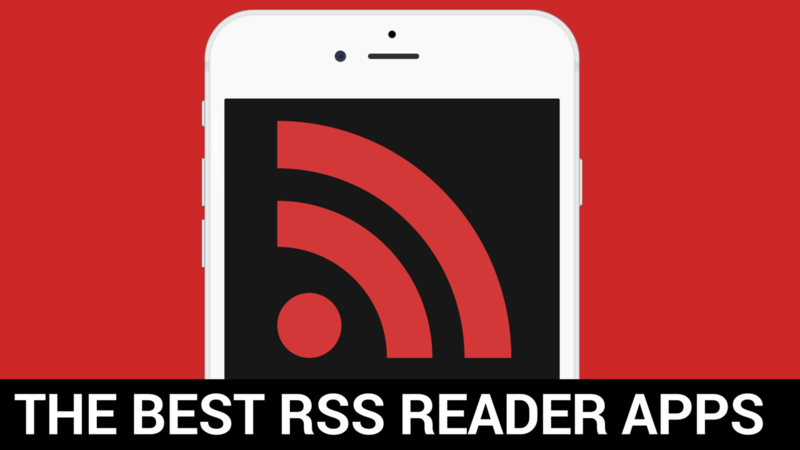 We will help you search through the best RSS readers available on the App Store. 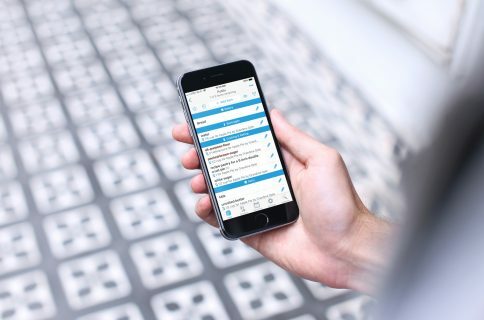 To tackle the challenge of finding the best RSS readers, we took a look at what features we would deem most important. To start, we looked at whether you could add RSS feeds yourself, or if you needed an account of some sort (like Feedbin or Feedly). Sharing is also extremely important to news stories. That’s why we prioritized both saving options for yourself, as well as external sharing options to send to others. Lastly, we looked at the reading experience. How is the typography, cleanliness of the app, readability, and UI configurability options. 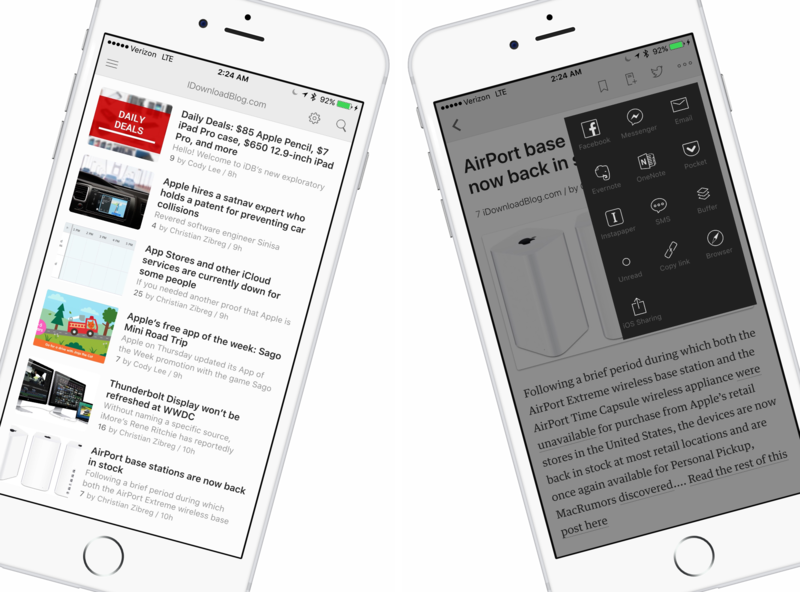 Apple launched their News app in iOS 9, which I admit is a great option for the casual user, but there is plenty of content coming in through RSS that you may want to do more with. Such as organizing it, grouping it, or marking articles as read. So if you are interesting in upgrading your existing RSS reader, or getting into one for the first time, read on. 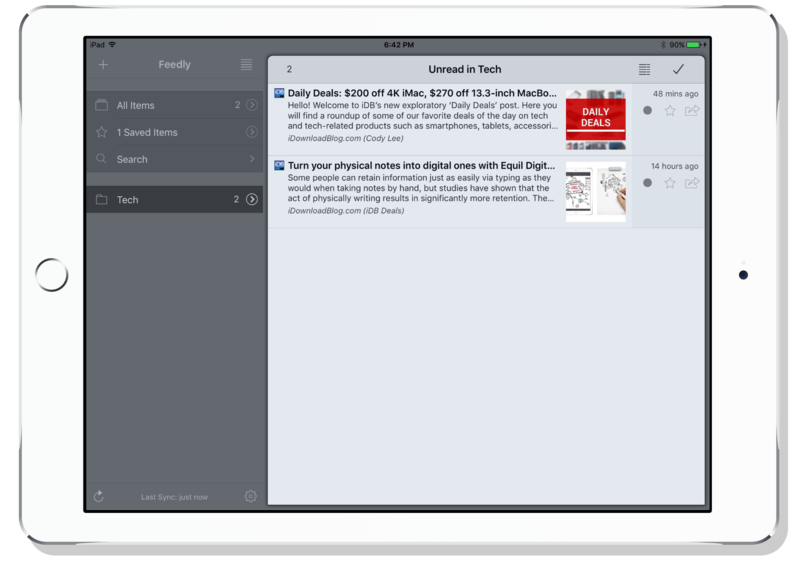 Reeder is a very popular RSS app and has been for some time. Currently they are on the 3rd major version and it includes some great features. On the Home screen you have many options to get started including many services like Feedly, Feedbag, Feed Wrangler, etc. It even supports Read Later services like Readability and Instapaper. Lastly, it also supports raw RSS. You can easily add your own feed and put it on the same ground as all other options. When browsing your feeds, it breaks it into 3 options. Starred, unread, and all. This makes it easy to sort and see whats new. There is also a wealth of customization for the UI. You can alter the background color into 4 shades, including night mode, and a sepia-like paper color. You can adjust the font itself, as well as the size. This is the most options for customization amongst all our apps. The other big thing Reeder has going for it is the healthy list of sharing options. I doubt there is an option here you are looking for and won’t find. 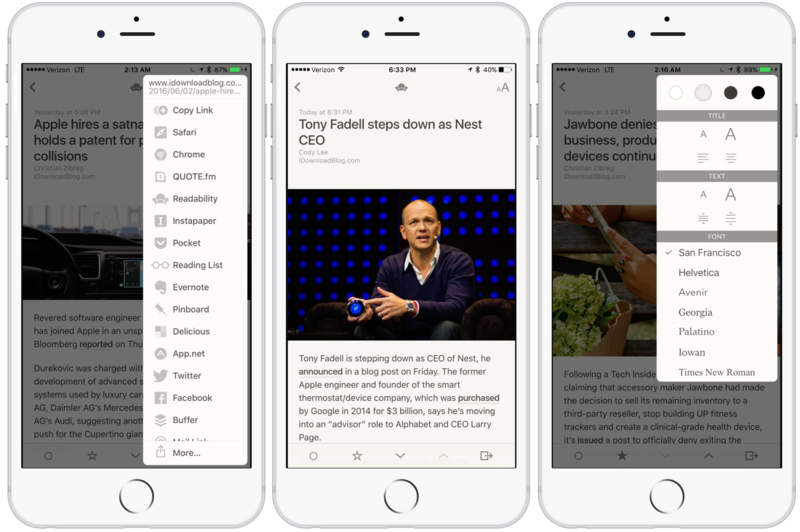 When I’m reading through news, sharing is something I do all of the time, and this makes it easy to save for myself, to something like Safari’s Reading List, Twitter, Messages, or anything in the iOS Share Sheet. Notable Features: All encompassing list of sharing options. Many customization options for the UI including background colors and fonts. Unread is probably the best looking app. For the casual user, this may be the best option. 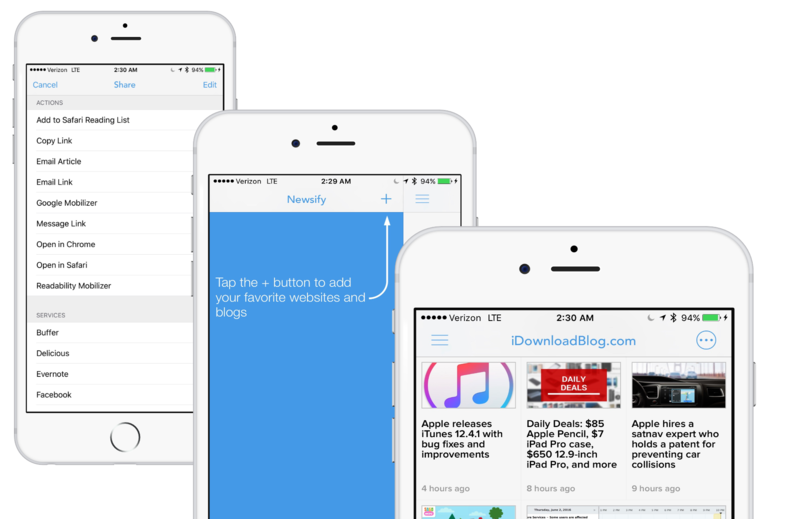 It offers a free mode that limits the number of articles you read. This is nice, because if you don’t use this all the time, you can get nearly all the premium features, for free. 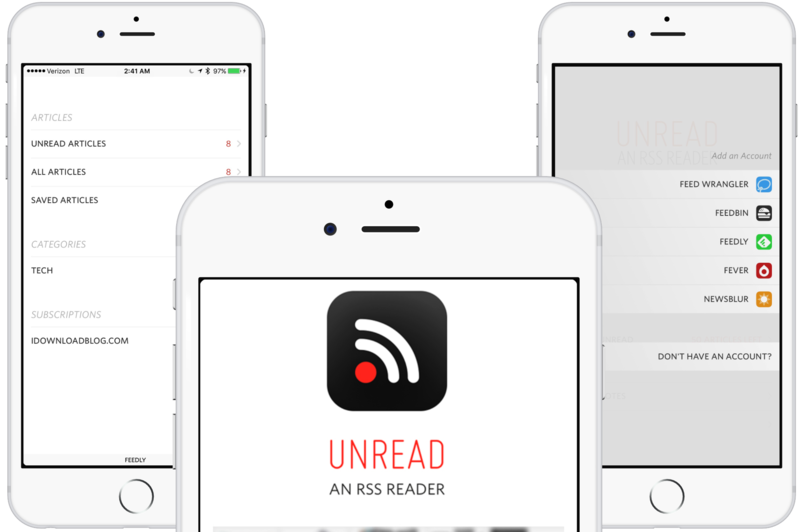 The app is quick and simple, but the biggest problem is you can’t simply add an RSS feed. It does require you to use an account of some sort. Your options are Feed Wrangler, Feedbag, Feedly, Fever, or Newsblur. Some of these names sounding familiar yet? While it is unfortunate you can’t add a RSS feed without an account, it isn’t a huge deal. Those often offer major benefits, but it is another step to go through. When adding an account, it was a nice touch they built in 1Password integration which is always appreciated. I added my Feedly account, and it easily broke it down into unread, all, and saved. As well as any categories, and subscriptions I had. Gestures are really great here as well. When you are in an article you can swipe left to right to go back a page, right to left to open a contextual menu, or bottom to top to go to the next post or article. The contactual menu that appears from the right allows you to save or mark an article as unread. This keeps the reading view nice and clean without any menus to clutter it. You can also view in your browser, change the theme, and share from the menu too. A downside could be the lack of customization, but I easily forgive this fault. The app looks great as is, but i you do want to change it up, you can enter readability mode, or change to one of the 7 themes available. Unfortunately, those themes (including a night mode) are limited to the premium mode. Notable Features: Clean, minimalistic, gorgeous UI with no clutter while reading. Easy intuitive gestures. Unfortunately, Mr. Reader is iPad only. That may knock this off the list for many people. But if you read on your iPad, stick around because this app is great. It offers a hearty supply of syncing services (AOL Reader, Feedly, Feed Wranger, to start), and plenty of sharing options. This may actually have the most as far as sharing options go. You can post to Tumblr, add to a link shortener, open with 12 different browsers, as well as a handful of 3 party apps such as Hootsuite, or searching Wikipedia. Themes look great on Mr. Reader, and several are available. There are simple ones that make reading enjoyable, and night mode ones that are great for evenings. You can change the toolbar position, set preferred view mode, change font family and size, as well as a built in tag system. You can also file your feeds away into different groups or folders. There are even more to be done inside the settings itself. If you like to read your news in a format thats akin to a newspaper, then you may really enjoy Newsify. It takes any of its repopulated options, or any RSS feed you fancy, and turns it into a view that looks similar to a newspaper. It groups them into a grid system with a little bit of text or a headline, and an accompanying image. When viewing an article, you get a navigation bar on top, as well as a toolbar on bottom. On the bottom you can quickly mark an item as unread, save for later, or share. If you don’t like the newspaper styled layout, you can opt for a straight list option, but what fun is that. Swiping to the right opens a menu on the left that shows all items, unread, or saved, as well as all your sources. It shows the last time it fetched for new articles down on the bottom. This is also how you get to settings. There are actually many options here for customizing, including a unique “Auto Night Mode” that comes in very handy. Otherwise, many options for font, size, and order. You have lots of different sharing options which is always nice to see. Lots of services like Pocket, Evernote, or Instapaper. These special services aside, you have the old iOS Share Sheet standby with even more choices. My biggest complaint is the banner ads. They look especially bad in night mode, where they are still blindingly white. If you upgrade to premium you can ditch them for a $2.99 a month IAP. Premium gives you full text search, no ads, automatic full text, and more images. Notable Features: Unique newspaper-esque layout. Auto night mode comes in handy without having to manually change anything. Feedly has been mentioned several times so far in this post. It is two separate things. 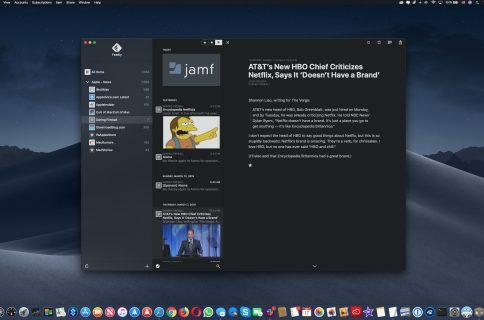 It is a service, that syncs your RSS articles between your devices and browsers, as well as giving you a built-in discovery section to find more feeds to follow. It is also an app that allows you to add your own feeds and view them on your device. It isn’t very obvious how to add your own RSS feed unless you know how though. You actually take your URL, then paste it into the search bar used to find new content. It will then parse that URL and allow you to add it. You can customize how it displays your feeds, including a standard list view. There are quite a few sharing options, but by far not the most we’ve seen in these apps. Essentially a few more than the standard Share Sheet. Of all of them, they seem to prioritize Twitter. It is in the share menu, in the bottom under the large “Share” button, and then there is a Twitter icon up at the top. So 3 places to get that story onto the bird-based social network. Notable Features: Built-in syncing service. Discovery of other feeds. Flipboard is our honorable mention of this post. It is really positioned as a customized magazine. It looks really gorgeous and has been featured by Apple several times. They really push discovery, and give you lots of ways just to find new content. Content literally flips by as you go post to post. If you do however attempt to bypass all of the actual curated content, at the bottom there is a search icon. Here you can actually enter a RSS feed URL. It will then add it to your “Following” list, which is the second tab on the bottom. This lets you easily just go in and read that particular feed. We did try to shy away somewhat from syncing services and discovery apps, because it gets into a grey area of RSS, or just a news app. There are still many apps out there that we didn’t even touch on that count as an RSS reader, though. Are there any really stellar RSS readers you want to let us know about? How many people out there still use RSS, or have you migrated to the new Apple News app? Please also let us know your suggestions for other app roundups as well.